Monsignor Joseph E. Schieder advised Presidents Dwight D. Eisenhower and John F. Kennedy on youth issues. In the 1950s and '60s, he was arguably Buffalo's most renowned Catholic priest, writing books on youth and their concerns and regularly traveling the country and abroad to speak at youth conferences. The president of Italy even awarded Schieder a "Star of Solidarity," one of that nation's highest honors for noncitizens. But behind his accomplishments, Schieder hid a dark secret. The secret wasn’t revealed until 2018 – more than two decades after Schieder’s death at age 87 – when his name was included on a Buffalo Diocese list of priests with substantiated allegations of child sexual abuse against them. He must have been a time traveler from the 60s or 70s. 1. He must have been a time traveler from the 60s or 70s. 'cause OtherPope Ratzo proclaimed that the hippies caused all the buggery. The Ratz maybe have ignorant people in his audience, but his attempt at deflecting the blame isn't fooling everyone. A concelebrated Mass of Christian Burial for Monsignor Joseph E. Schieder, a personal adviser on youth to Presidents Dwight D. Eisenhower and John F. Kennedy, will be offered at 10 a.m. Monday in St. Andrew's Catholic Church, 1525 Sheridan Drive, Town of Tonawanda. Bishop Henry J. Mansell of the Buffalo Catholic Diocese will be principal celebrant. A parish Mass will be offered at 7:30 p.m. Sunday in St. Andrew's, with Auxiliary Bishop Edward M. Grosz of the Buffalo Diocese as principal celebrant. Burial will be in Mount Calvary Cemetery, Cheektowaga. A Buffalo native, Monsignor Schieder, 87, of Williamsville and Fort Lauderdale, Fla., died Wednesday (June 12, 1996) in Sisters Hospital after a lengthy illness. He attended St. Nicholas School, St. Joseph's Collegiate Institute and Niagara University. He received a master's degree from St. Bonaventure University and a doctorate in philosophy from the University of Ottawa. Ordained June 15, 1935, he celebrated his first Mass at St. Nicholas Church. He subsequently was assigned to a number of parishes and later became national director of Catholic Youth of America in Washington, D.C. He also was dean of theology at Marymount College in Arlington, Va.
From 1963 to 1976, he was pastor of St. Andrew's Church and was founder and headmaster of St. Andrew's Country Day School in the Town of Tonawanda. He was director of diocesan properties and held other high diocesan posts. While serving as director of Catholic Youth of America, which embraced some 7 million young people, he was a member of the President's White House Conference on Youth in Washington. He received many awards, including the Star of Solidarity from the president of Italy for outstanding international youth work, one of Italy's highest awards. He also received the Silver Award from the mayor of Rome for his accomplishments as director of the World Youth Meeting in Italy. In 1984, after his appointment by Bishop Edward D. Head to be procurator of the Diocese of Buffalo, he received the Signum Fidei Award from St. Joseph's Collegiate Institute as outstanding alumnus. It was the first time in 23 years the award had been given. Survivors include a sister, Dorothy. "The following list identifies diocesan priests who were removed from ministry, were retired or left ministry after allegations of sexual abuse of a minor," the diocese said. The list includes deceased priests with more than one allegation made against them. Priests who are deceased have their year of death listed next to their name, the diocese said. The list includes 26 priests who have not been previously linked to allegations of sexual abuse. Some of the priests have already been publicly identified. Civil suit reportedly filed in FL in late 2009 or early 2010 accuses Schieder of abuse in the Miami archdiocese. Msgr Schieder was included in 3/20/18 Buffalo diocesan list as removed, retired, or having left ministry after allegations of sexual abuse of a minor. 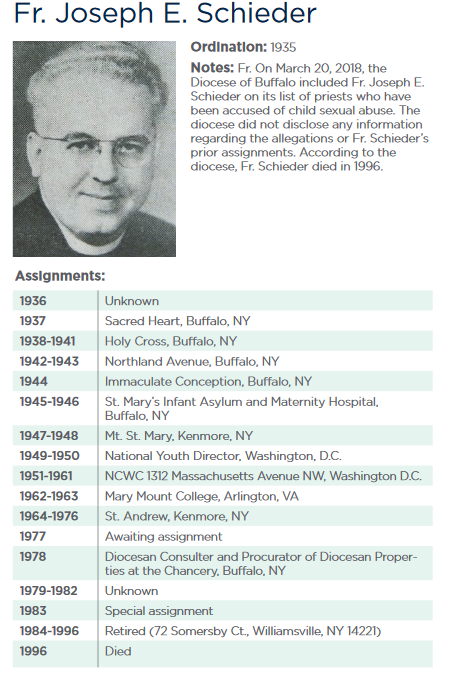 Listed as having died in 1996; the Buffalo list includes deceased priests only if they have more than one allegation. Worked as parish priest and chancery official in Buffalo. Was also national director of Catholic Youth of America in Washington DC and dean of theology at Marymount College in Arlington VA. There are several gaps in his assignment history. Died 6/12/96.